Oh boy! Oh boy! Oh boy! 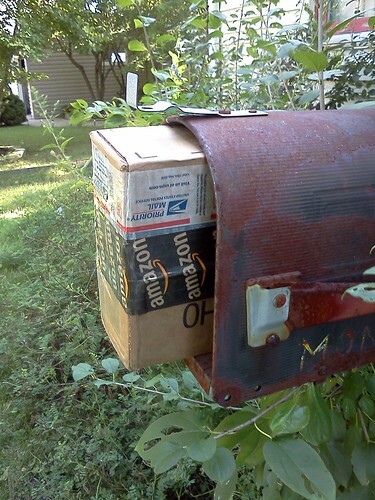 The postman has jammed a box in the mailbox. I'm not expecting something so what could it be. Ah, it's from Meredith. Despicable Me 2 bandages! Oh my. I almost want to make a paper cut just to see what they look like. Almost. Paper cuts are almost worse than broken bones. It doesn't take much to make them throb like the dickens. I moved the bandages to the bathroom next to my "Crime Scene" bandages. 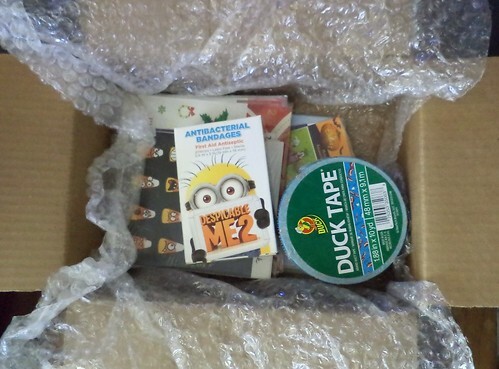 Why on earth would she be sending me Duck Tape? Oh look. This is why. 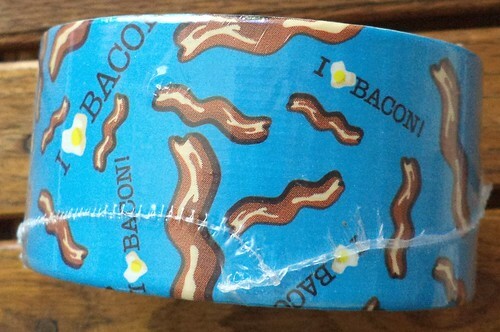 It's got images of bacon on it. Bacon is kind of a recurring theme in chat in my World of Warcraft guild. Our Facebook page has all sorts of puns and images and recipes of and about bacon. I don't have anything that needs to be duck taped, at the moment, but when I do, I shall eschew the gray stuff for the more stylish bacon emblazoned kind. Below those two items were stickers, lots of stickers. That is a lot of stickers. I image her going through the store just grabbing whatever looked interesting off the rack. 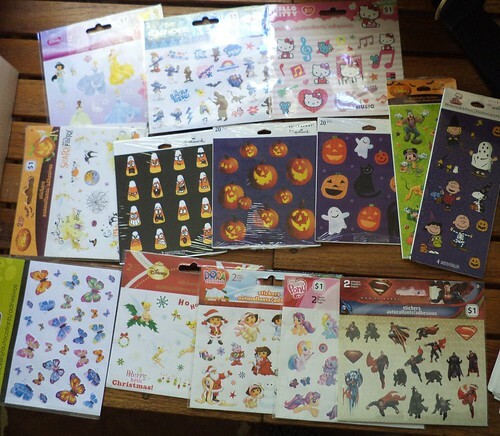 My friend, Patt, had sent me another pad of stickers. Look at that. 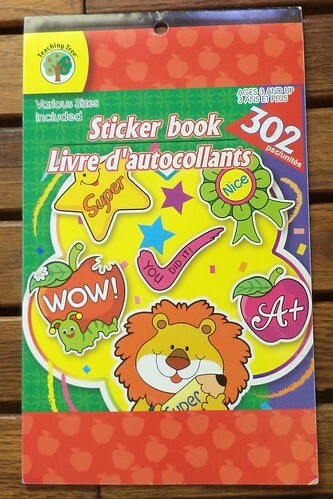 Three hundred and two stickers. Between the two of them, I am probably set into the new year. I have been just making a pile and stuffing the stickers into my messenger bag. But, they were getting bent and lost so I had to do something else. Viola. There's a reason some stuff gets saved. The stickers I'm currently using and which are on 8.5 x 11 sheets are in the blue folder. All the small sheets and the new ones from Patt and Meredith are in the tan folder. As I use up the blue, I can supplement with the tan. Plus, they aren't scattered all over my messenger bag to the point of wondering where they all are. 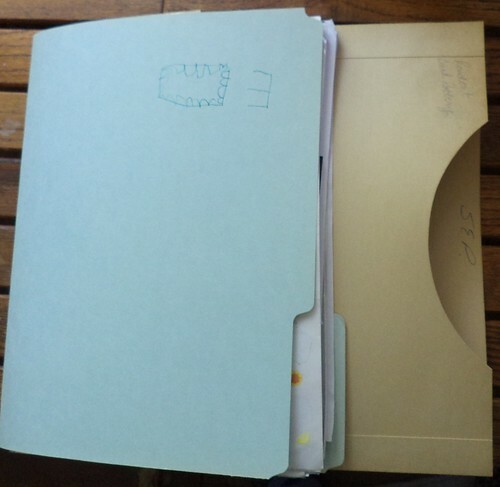 I even put stamps and return address labels in the blue folder. I know. I know. That's getting organized. Something must be wrong with me. 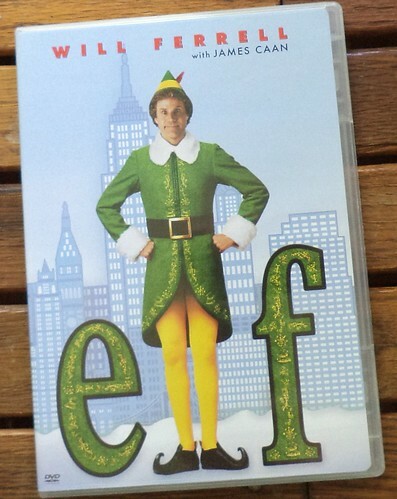 The last thing in Meredith's box was this movie. I have seen small bits and pieces of this but not the whole thing. I missed it in the theatre. I'm really not that big of a fan of Will Ferrell. Meredith said she's not either but she loves this movie. "I think you'll love it and I'm going to send it to you." "But, I don't want to take your movie," I said. "I have two copies," she replied. "Someone thought we didn't have it so I'm sending you the extra." Now, I have not had time to watch it. As fall approaches and I make time on evenings and weekends to finish up the scarves I'm giving for Christmas gifts, this will be the perfect thing to pop into the DvD, sit back, grab Pilchard and crochet away. I'm so grateful for Patt and Meredith. They made me so happy.